If the price tag is stopping you to invest in a mortar or brick garage (which is a big commitment) then you can opt for a carport, which is an affordable option! A carport is an ideal solution for shielding your car from external elements. From ready-made to custom-built carports, Complete Home Improvement’s range of carports is simple, elegant and cost-effective, made to protect your car. Do you want a solution to protect your car from the harmful rays of the sun? Complete Home Improvement can assist you to get a single or multiple carports in Sydney. Your car is an important asset and at Complete Home Improvement, our array of affordable carports has made your decision even simpler. We specialise in custom-built carports and can build carports of any size and shape as per your exact requirements. Moreover, when it comes to Sydneyites, they love their cars and always want to safeguard them in any type of weather conditions. With our ultra-modern range of carports, you can park your car outside your home without worrying about the changing climate. No wonder DIY carports are available everywhere from retail to online stores and they are cheap as well, but are they completely risk-free? 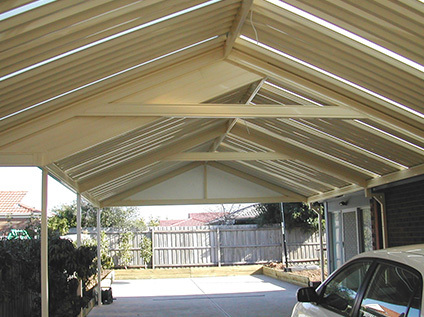 That’s why Complete Home Improvement offers professional carport installation in Sydney. Why park your car elsewhere when you can customise and install your carport at your own place. With our vast range of products, you can customise the span, length, and height of your carport with ease. As Sydney’s one of the best carport builder, we offer a huge range of high-quality Australian made carports including flat, skillion and gable. Choose from our quality range of carports and keep your car’s paint intact. If you want to revive your existing home with an innovative and functional carport, Complete Home Improvement can be as creative as you haven’t imagined. Call us on 1300 912 293 to know more about our custom carports today!